So, the bike wouldn't start at work this afternoon. When I turned the key, no fuel pump noise. Only Neutral lamp and oil lamp came on. LCD panel shows info but no back light. Front indicator lamps and rear indicator and tail lamps are on. Motor turns over but no ignition. Lock the ignition and remove the key and all those conditions remain. You could try an ECU reset. But he gets headlights and dash lights. I do not. His suggestion that getting power to the fuse block would affect the dash lights and headlights interests me. We did disconnect the battery for 15 minutes to try the ECU reset, but no luck when we hooked the battery up again. Still no fuel pump, no head lights, no dash lights. Front indicators on solid, rear indicators and tail light on solid. Lock the handlebars and ignition and take the key out and everything stays on. Sounds like flat battery, try a jump start from a car. That wouldn't cause this: "Lock the handlebars and ignition and take the key out and everything stays on." That is the most curious part isn't it. West Aussie Glen can't access this thread. Is it possible for an admin to check his privilege? I cant fix either problem..
Because the problem doesn't appear to be wiring (shorts and breaks act differently to this) it looks like electronics. The only electronic controller is the ECU which makes me think there is a case for a swap-out to troubleshoot this weird problem. This thread has my interest. I also own a .
Hopefully this is a one-off. Which doesn't help tifcat but maybe his fix will come in soon. or Item 5 in the next link if the one above doesn't work. I'll be checking the bike on the weekend. Appreciate the suggestions. I'll let you know. That was it!! Just rembered (after I turned it off!) that the ECU may need remapping. I'll disconnect the battery again tonight for a few hours and do it properly. I only ran it until the temp gauge showed a mark and idle RPM dropped. Not the full 15 minutes. I'll drive my car to work today and do the reset tonight. Ok, my last reply was a bit rushed, and I didn't really give any decent info. After I said I'd be looking at the bike on the weekend, I thought I'd take look to see if I could even see the cable. I could, and I could even fit my meaty hands in there. So I pushed on the plug and it went in about 1cm. It may have been less, but it felt like a lot. I was excited! So I put the key in the ignition and turned it to the On position. No change. Turned the key off and pulled it out, no change, all the lights stayed on. I reached in again and used the cable to try to push the plug in, and gave it a bit of a wriggle. No change. leaned over the bike to check the other side for anything strange, and the bike turned off and the HISS light began to flash. Could this be it??!!??!! Could it have taken 30 seconds for everything to catch up and sort their differences out over a cup of ECU Bus tea? So I put the key in and turned it to on. Everything initialised correctly. Headlights were on, dash illuminated, fuel pump primed. I hesitated for a second. Would I be disappointed if I tried to start it? Only one thing to do. Pressed the starter and after about 3 cranks it fire up and idled like normal! So, I'm not 100% sure the plug is in properly, and also not 100% sure the cable isn't damaged. But the symptoms have gone. I'll spend more time on it over the weekend to make sure the cable is ok, and is plugged in properly. Well done, time to ride it. If you arent too busy tomorrow, and want to test the bike, then head to Govenders Gourmet cafe in Joodalup around 1430. I will be there with the Joondalup Ulysses guys for coffee n cake. Don't want to take this off topic but a related comment. Do you have an ST1300 in pristine condition? Know the entire history of the bike? Never had issues with your ignition barrel? Yes? Then I need you (to take a photo of your barrel cable and connector)! Yes, you could be the proud recipient of my humble gratitude, by just posting a clear, well lit photo of the connector so I can compare it to mine. Want to see mine? Deal! Check this out. Look a bit dodgey? Show me yours! I'll post some photos of mine in the morning after I finish work unless someone else beats me to it. However my ST is a police model so I don't know if that will make any difference but I guess we'll see. When looking at the two parts lists I noticed that the US 1300 doesn't seem to have the HISS. They also have a different key blank (without a chip???). You are correct, no ST 1300 ever sold in the USA or Canada has had the HISS anti-theft system. In North America, we rely on the thieves to steal Harley-Davidsons, which they do with great regularity. I can't recall ever reading a report of a Honda ST being stolen, and I owned one for 18 years. This means that North American spec STs can use any key blank that physically fits into the key cylinder. I don't know if our ECUs are different, or if Honda used the same ECU in all STs and just ignored the HISS capability when they built the bikes destined for North America. I do know that if you mention HISS on a North American ST forum, you will get a blank look back from everyone except the European participants (all the European ST 1300s were fitted with HISS). Well, the daylight is over, and I'm more confused than ever. I had thought from what I saw in the photos above, that the plug was missing. 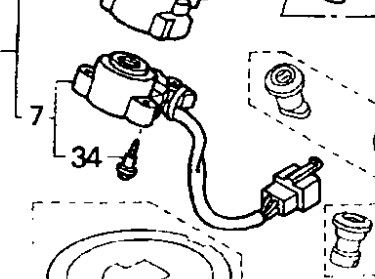 The parts diagram in the links above provided by Allans1100, showed the bottom of the ignition barrel with a short cable and a 4 pin plug. I decided to pull off the plastic so I could get a better look. 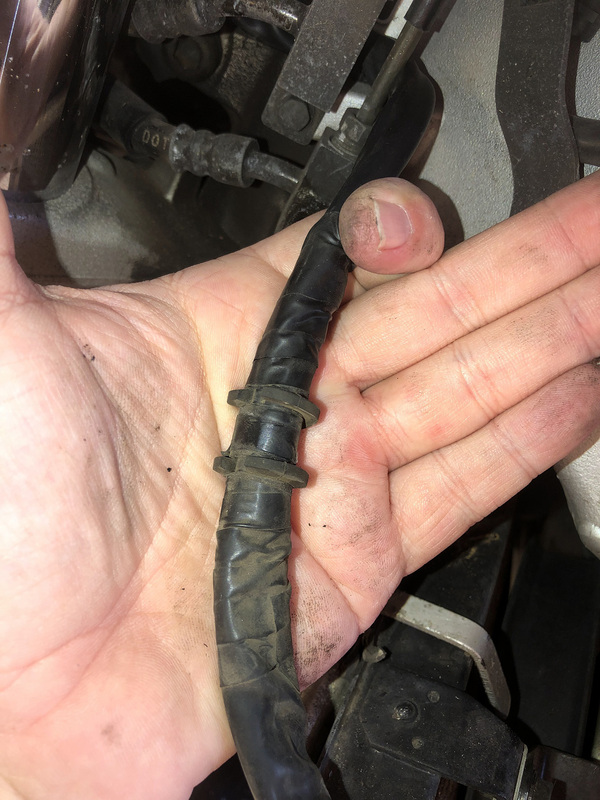 I had an inkling from the 'electrical tape' that someone had removed the plug and the socket from the wiring harness and had hardwired the two together. 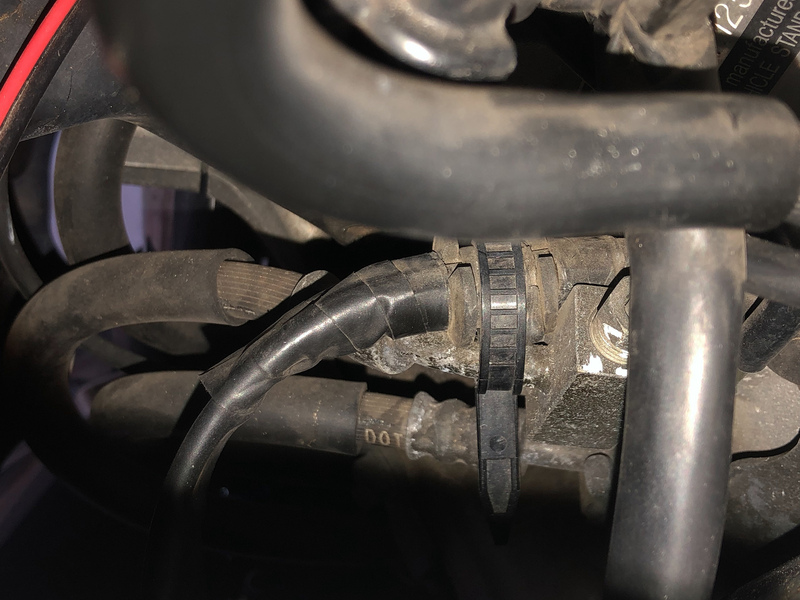 Perhaps the cable had gotten damaged, and this was their solution, rather than paying a grand to buy a new wiring harness, and slogging through stripping the bike down and replacing it. Pulling the cable through, I figured I had surmised correctly, and I began to pull off the tape wrapped around the cable. To my surprise, I found a cable which was not joined, but was whole and still covered with the black factory cover. I'm now feeling I'm a parts diagram noob, and perhaps the diagram isn't exact. The length of the cable may run from the front to the back of the bike, but to put that in a diagram would be a pain. I personally expect that if the cable is long, but represented in the diagram as short, it would have some sort of cut in the cable to indicate that the entire length of the cable isn't displayed. 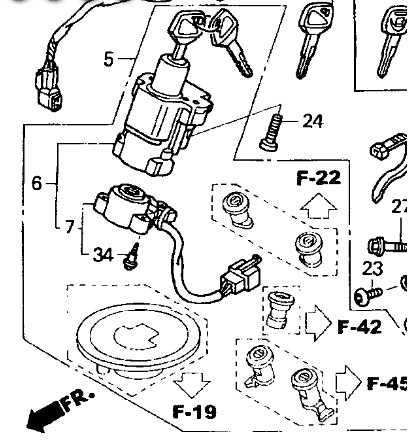 Also, if you check out the diagram on the linked page, there is an arrow and F-19/F-22/F-42/F-45 beside the plug. 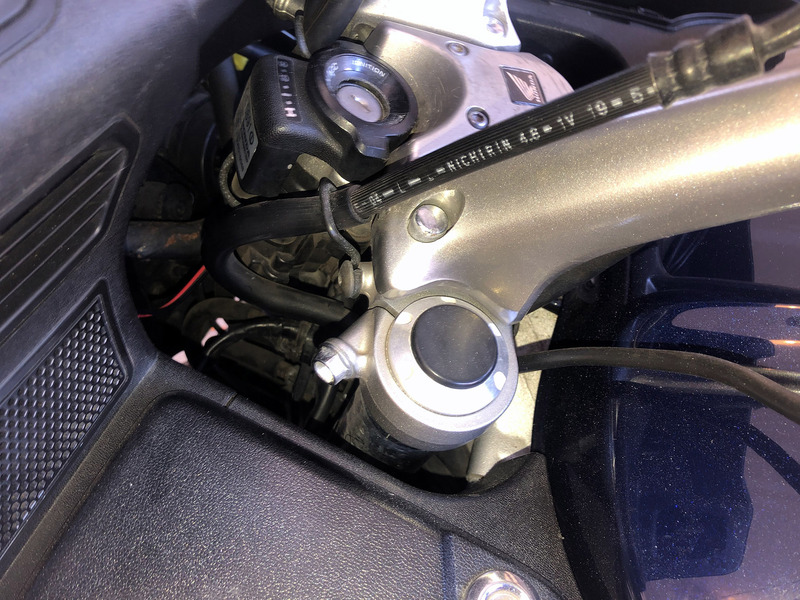 I supposed that perhaps that shows that the cable/plug ran down to the location of the bike related to that diagram, and it would appear there. But the diagram for F-22 is the pillion passenger grab handles. 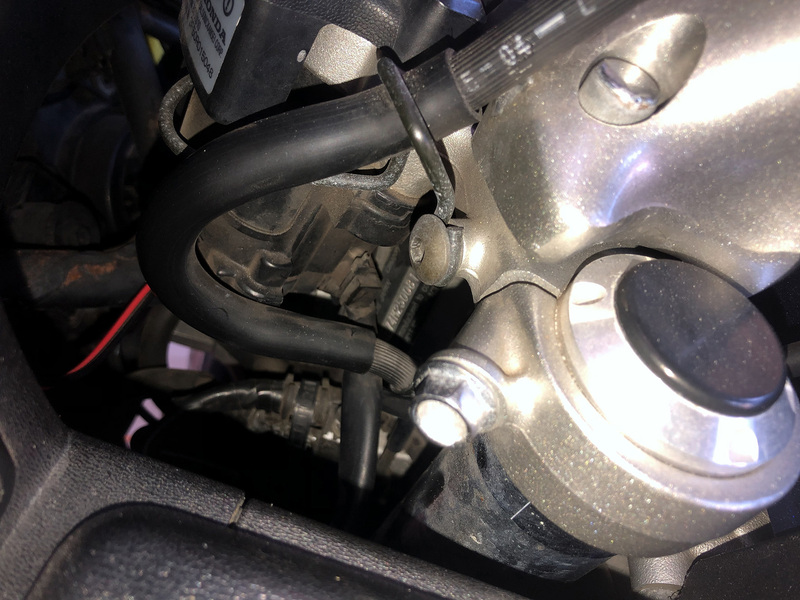 There is no indication or reference to the ignition barrel cable/plug. So I spent some more time looking around and staring blankly at the parts diagram, and I came to a realization: The diagram is all about ordering new parts, not explaining where things go. The ignition barrel and cable can be bought in a group of parts (in this case, the group is in a box, which is numbered '5'). These parts include the fuel tank cap, the lock barrels for the pillion grab handles, the barrels for the locking pocket (pie warmer) on the left fairing and barrels for the panniers. These have nothing to do with the cable, but everything to do with the key that is supplied with the ignition barrel. So they are shown on the diagram, as they can be purchased in a group. All this time the bike was working correctly. I periodically turned the ignition to on and everything initialized correctly. I couldn't walk away from the bike splayed across my garage so I put it all back together. I only had one spare screw at the end :-D. I decided I'd turn the HISS light off, as I had previously, because the ECU reset had probably changed that. I turned the key and *hangs head* it failed. So I'm back to the drawing board. 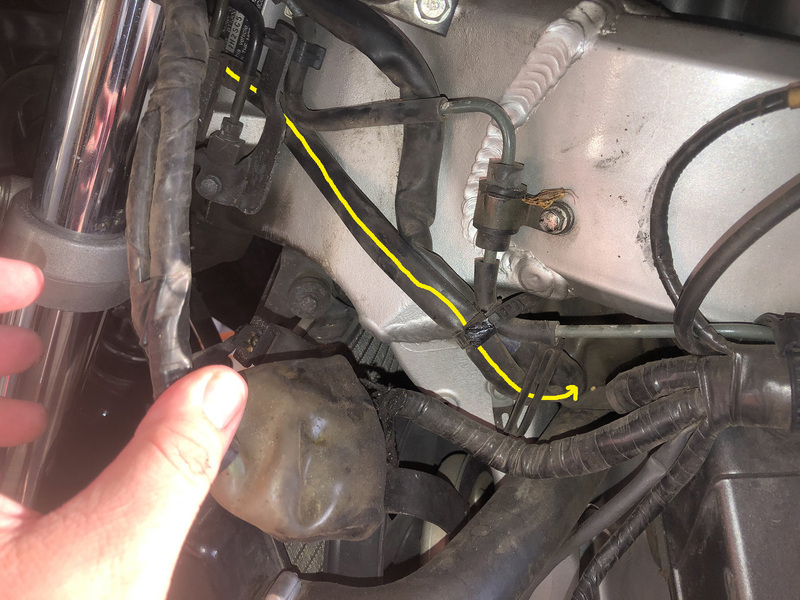 Either the cable is broken inside, it's not the problem but something else is, or where it connects to the ignition barrel is worn/loose. I didn't get enough pulled off to access the barrel properly. It makes sense that you would directed to be F-22 (grab rail) because the ECU is located in that area and that's where the cable would go to. 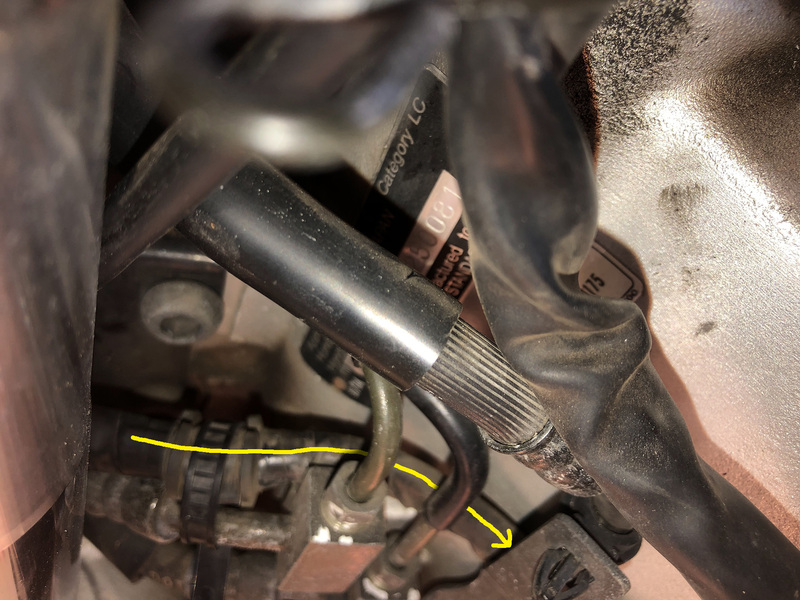 Looking at the images posted mine looks the same though cable loop is further away from the fork tube which would mean little to no interference from the fork when turned to the right. Considering you pushed plug in a little had me wondering if the one or two of the securing screws had loosened or fell out. Ideally it should not move. The other thought was the red wire shown in one of your images; it appears to come out of the ignition switch block which is not standard. I do know that if you mention HISS on a North American ST forum, you will get a blank look back from everyone except the European participants (all the European ST 1300s were fitted with HISS). Oh no, that's not why that reference is there. As I said, group 5 includes the lock barrels for the panniers, the grab rail the fuel tank cap and the left fairing pocket. Hence the references. Also, the cable runs down to a socket which is above, but in front of the motor. Of course the wire harness then continues down that way. Ok, that's my fault. It wasn't the plug that I moved. It was the cable in the grommet which is cable tied to the brake / clutch tube. The cable tie was loose, so the cable moved a bit. 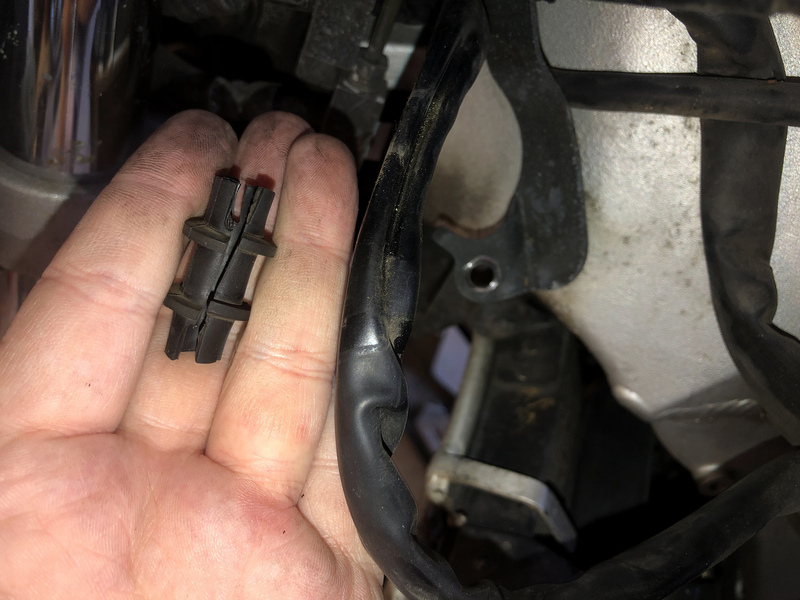 I have since tried to push the connector in the bottom of the ignition barrel, and it was solid. No movement. Yeah. That's not coming from the ignition barrel. It's a USB charging socket mounted in the dash. That's just the cable running by, photobombing the ignition switch. I'd be keen to see how this looks on your bike. Any chances of a photo? I very much want to get that #7 part off and pull it apart and check out the inside. Also test the wires while wriggling them around. I just don't have the facilities to pull it so far apart. Wish I had a nice clean workshop, a bike platform/lift, plenty of lights, all the tools and some known good spares to try a few things out. Or someone with the experience and tools, who's generous enough to come over and help. It's totally gotten me down. 2 days down the sink and no real results. 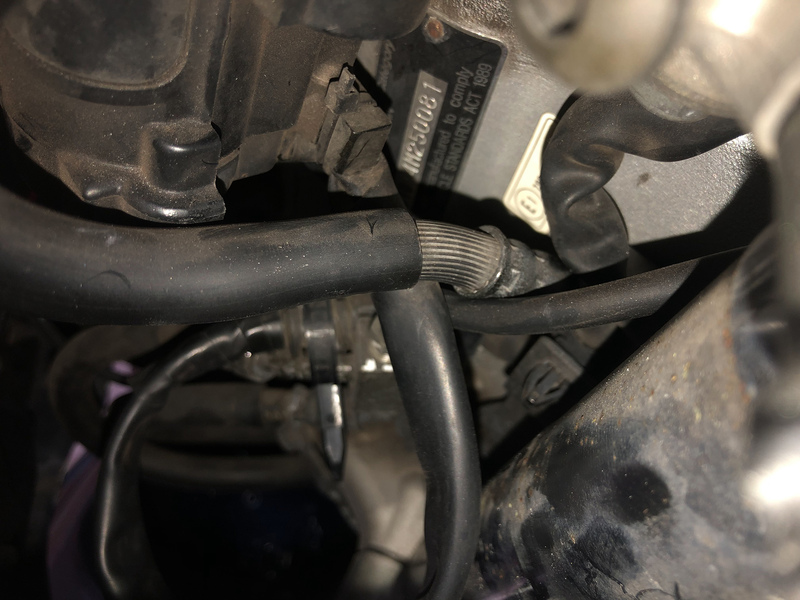 I have read a post on st-owners where the cable in the plug where it connects to the harness was corroded/broken. I simply checked it was securely plugged in, I never pulled it out and inspected it. Dummy. It's all back together now too, so I can't just check it.